Taxonomy is the classification of organisms into groups based on similarities of origin, structure, etc. 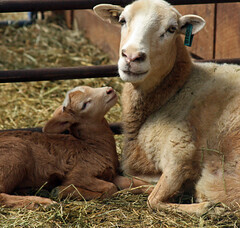 Sheep are closely-related to other farm livestock, especially goats. Domestication is when an organism is trained or adapted to live with people. Domestication often changes the appearance and behavior of the organism. While dogs were the first animal to be domesticated, sheep and goats are tied for second and are the first animals to be domesticaled for agricultural purposes. They were domesticated over 10,000 years ago. Life expectancy is how long an organism is expected to live. Typically, the life expectancy of an animal increases with size. For example, cows usually live longer than sheep. 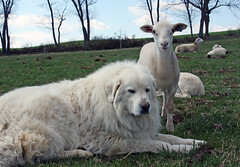 The life expectancy of sheep is similar to large breeds of dogs, about 10 to 12 years. Some breeds are known for being longer-lived, e.g. Merino. According to the Guiness Book of World Records, the oldest sheep lived to be 23. She was a Merino. However, the length of a sheep's productive lifetime tends to be much less. This is because a ewe's productivity usually peaks between 3 and 6 years of age and begins to decline after the age of 7. 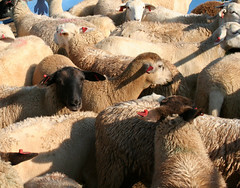 As a result, most ewes are removed from a flock before they would reach their natural life expectancy. It is also necessary to get rid of older ewes in order to make room for younger ones. The younger animals are usually genetically superior to the older ones. In harsh environments (e.g. where forage is sparse), ewes are usually culled at a younger age because once their teeth start to wear and break down, it becomes more difficult for them to maintain their body condition and consume enough forage to feed their babies. It is possible for a ewe to be productive past 10 years of age, if she is well-fed and managed and stays healthy and sound. 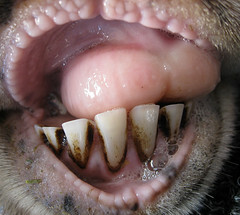 The approximate age of a sheep can be determined by examining their upper incisor teeth. 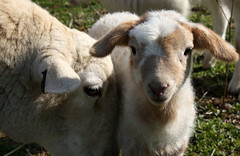 At birth, lambs have eight baby (or milk) teeth or temporary incisors arranged on their lower jaw. They don't have any teeth on their top jaw, only a dental pad. At approximately four years of age, a sheep has a full mouth of teeth. As it ages past four, the incisor teeth will start to spread, wear, and eventually break. When a ewe has lost some of her teeth, she's called a "broken mouth" ewe. When she's lost all her teeth, she's called a "gummer." A sheep with no incisor teeth can still survive because it uses mostly its molars for chewing feed. 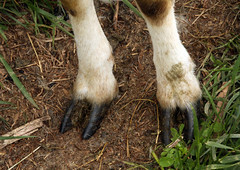 However, it will have a harder time grazing, especially short vegetation. A sheep that has rolled over onto its back is called a "cast" sheep. It may not be able to get up without assistance. This happens most commonly with short, stocky sheep with full fleeces on flat terrain. Heavily pregnant ewes are most prone. Cast sheep can become distressed and die within a short period of time if they are not rolled back into a normal position. When back on their feet, they may need supported for a few minutes to ensure they are steady. Vital signs are measures of various physiological statistics. A sheep's vital signs can help determine if it is sick or in distress.